Funny, how history repeats itself. Already the old Greek fable-ist and story teller Aesop (c. 620–564 BC), had the fox declare, that the grapes he could not reach were sour (The Fox and the Grapes). Today's fox is called Malcolm Turnbull and he proclaimed last Friday, the voting with a paper ballot would not help to achieve his aim to establish a republican regime in Australia. Therefore Turnbull advocated an "online plebiscite" on the abolition the monarchy as a precursor to a new republic referendum, saying web-based polls have become more reliable than the traditional paper ballot. How desperate must republicans be, if they do not trust in ballot papers anymore and put their hope in easy to manipulate online voting systems? Turnbull was speaking at a fundraising banquet in Sydney, on which Murdoch media (The Australian and MX) widely reported. They can rely on Rupert Murdoch’s propaganda machine. MX wrote: “Current [ARM] chairman Gallop said it was again time to discuss cutting ties with the monarchy after the topic ‘went off the boil’ ...”. Did you notice the subtle irony “it was time again”? How many revivals will the Australian republicans celebrate? Why not accept that the people of Australia have selected our Monarchy and help make it work for the benefit of the Australian people and the democratic institutions? “Gallop said ARM had spent the past year rethinking how the subject should be re-introduced.” And the result of a one year thinking is the grandiose proclamation “web-based polls have become more reliable than the traditional paper ballot”. Do they really believe this could bring a republican system to Australia? The grapes will remain sour for Australian republicans. 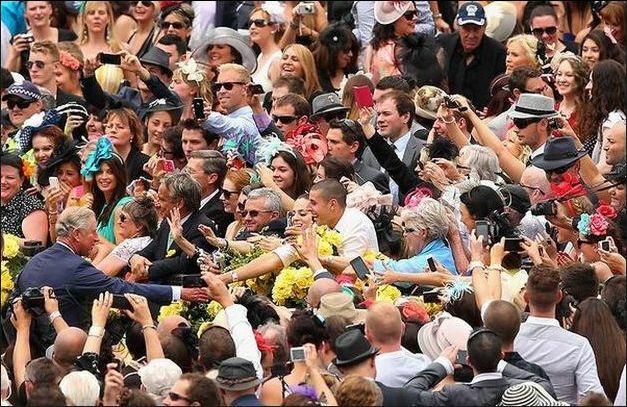 Prince Charles in Melbourne: In November 2012 a huge crowd welcomed Australia's future King - more than would ever turn out to see Malcolm Turnbull. Online polls are only more reliable for Mr Turnbull because he, like many rich, out-of-touch republicans, still labours under the delusion that the vast majority of Australians want a republic. Seeming perplexed every time ordinary scientific polling produces robust opposition to a republic, he concludes that online polls (which often become number battles between two big lobby groups urging their supporters to vote in the poll en masse) are more reliable because they more consistently produce results in accordance with his assumptions.